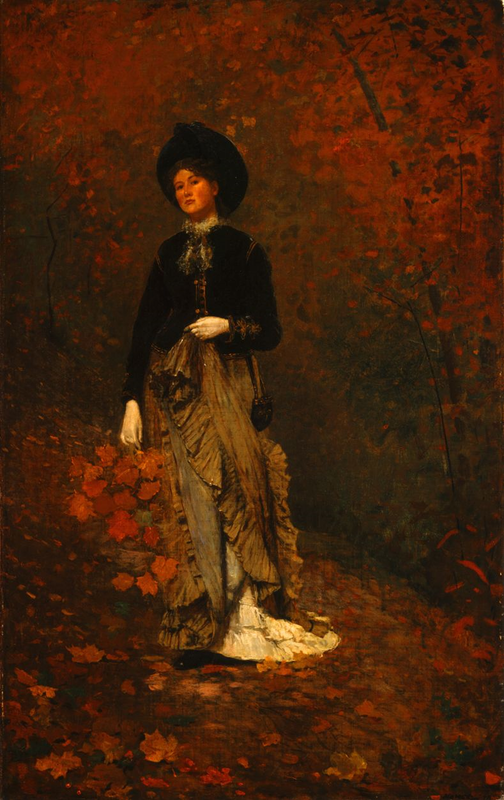 All the leaves are off the trees now, but the woods near our house are blanketed with leaves that remind me of this painting everytime I go by. Have you seen this one at the National Gallery. It looks atypical for Winslow Homer. I associate him with the sea and open fields. Doesn't he usually have much more light in his work? This one really seems to be all about the leaves. The woman in it feels a bit secondary. That painting ought to be a book cover. Stunning colours. I love that painting! Autumn is my most favorite time of year; love the lush goldeness of it all! CB: I have seen it at the NG. I think you are right about more light…open fields. My favorite is Snap the Whip. The leaves are almost impressionistic compared to the woman. Vintage Reading: I wouldn't be surprised it was a book cover. Amanda: Autumn is my favorite as well. This is one of my favorite paintings at the National Gallery. I love her expression, like she is assessing the painter or the viewer. I love that whole section of the gallery – the early American paintings and the British landscapes. I feel like I get something new every time I stop in and look at them.